Kermit Siragao is the most popular Siargao Surf Camps and one of the best places to stay on Siargao Island in The Philippines and for good reason – the great atmosphere, amazing food and variety of surf packages make it the ideal base for any traveller heading this way and is my favourite place to crash. Now That’s An Epic Drink Deal! The surf camp itself is full of awesome vibes (as you’d expect from a surf camp!) and you’ll be mixing with people from all around the globe, chatting about waves, doing some yoga or just chilling out after a big surf session! It’s owned by an Italian called Gianni (total legend, tell him I said hi!) so there food at Kermit Siargao is the best on the island – from pasta dishes, salads and local Filipino food to their incredible stone baked pizzas. I ate there for 90% of my meals during my last stay on Siargao – just save room for the deserts! Kermit Siargao Surf Camp also as one of the most famous drink deals on Siargao, if not the Philippines and I’m sure you will have clocked the sign on this blog before. 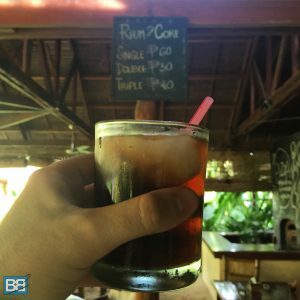 Grab a rhum and coke (no, thats not a typo!) where the more shots of rum you add, the cheaper your drink gets. Not per shot…nope the whole drink! It’s basically because it’s cheaper to import rum than coke! Happy days! Of course if you’re looking at hostel reviews you probably want to know about where you’ll be sleeping at your Siargoa Surf Camp! 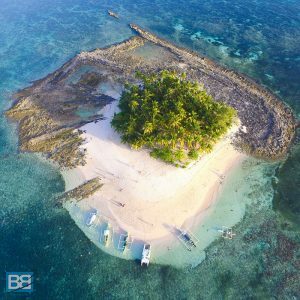 Kermit Siargao is nestled in amongst the tropical palm trees of the General Luna area of Siargao, just a minutes walk to the waters edge, where beautiful beaches await and a short paddle across the channel to the surf break of Cemeteries. Kermit Surf Camp has a variety of options to choose from depending on your style and budget too – from cottages and A/C huts to backpacker fan rooms and the K House which is perfect for a group of people travelling together. For those on a tight budget the shared backpacker fan room is the cheapest option from 950PHP (about £15) per night and sleeps 2 people. …I’ve also heard rumours from owner Gianni that they could be adding a dorm style rom soon, which will be even better value for money! Although Kermit Siargao isn’t just for surfers it’s called Kermit Surf Camp for a reason and Siargao is surrounded by some amazing surf breaks! Whether you’re wanting to learn to surf or you’re already an experience surfer Kermit is a great base for your time on Siargao. Their beginner surf camp package includes everything you need to learn to surf – including private surf lessons, surfboard hire, transport, accommodation and even breakfast. So you can simply arrive and get into the ocean! If you already surf they also have a guided surf camp option – where you’ll be joined by a surf guide who will take you to the best breaks for your ability each day. Again transport, surf kit, airport transfers and accommodation are all included, so it’s ideal! These views are just a short walk away! Siargao instantly became one of my favourite islands on the planet and not just because of the surf – it’s stunning! In fact I’d go as far as comparing it with the Maldives, but without the price tag and it’s one of the best places to visit in the Philippines! If you’re not busy scoring waves the guys at Kermit Siargao also organised day trips – including island hopping (my personal favourite) the Magpupungko Rock Pools and a lagoon tour. So if it’s flat or you just want to rest up there’s plenty of sand vibes to experience! Check this post for a few pics that show that Siargao Island Is An Island Paradise! Make Sure You Join The Island Hopping Day Trip! The bottom line is you’re going to have a blast on Siargao and Kermit Siargao Surf Camp is the ideal base for your stay there – in fact it’s made my list of best hostels in the world…which is no easy feat considering how many places I’ve stayed at over the years! Its consistently voted as the best Siargao Surf Camp! 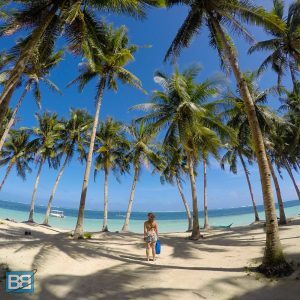 Siargao Island in the Philippines is one of my favourite parts of the world and if you’re heading to the Philippines soon it should certainly be on your bucket list. If you do decide that palms trees, pumping surf and empty beaches are something you want to enjoy (and who wouldn’t?!) I wouldn’t hesitate to recommend Kermit Siargao. Just be aware that it’s reputation is fast spreading and you’ll find it books out around 6 weeks in advanced, so book early to avoid missing out – you can book both the beginners surf camp and guided surf camps over at RTW Backpackers. So kick back, relax and enjoy your stay! Have You Stayed at Kermit Siargao Surf Camp? Thanks for the blog post and review! It’s an amazing place to travel Jade and everyone I met was so friendly! Most people speak English fluently too, which although slightly lazy on my part does mean it’s easier to communicate and get around!